Newsroom - American Airlines Announces New Program to Recruit Next Generation of Pilots With Launch of Cadet Academy - American Airlines Group, Inc.
FORT WORTH, Texas – American Airlines announced today a first-of-its-kind program designed to help future aviators receive the training, financing and mentoring opportunities they need to fly for the world’s largest airline. The American Airlines Cadet Academy will provide an opportunity for future pilots to become first officers at one of American’s three wholly owned regional carriers and eventually fly larger aircraft at American. Once selected, cadets will choose to train at one of American’s partner flight schools in several locations nationwide while having the option to work with Discover Student Loans to apply for a loan up to the total cost of the program, including room and board. Once selected, cadets will train for up to 18 months with one of American’s three flight school partners: American Flyers in Dallas, TX and Pompano Beach, FL; Crew Training International (CTI) in Memphis, TN; and CAE in Phoenix, AZ. The financing program from Discover Student Loans will provide cadets with competitive variable and fixed interest rate private student loans with zero fees and deferred payments for up to three and a half years, while the cadet completes the program in preparation for prospective employment with Envoy, Piedmont or PSA. 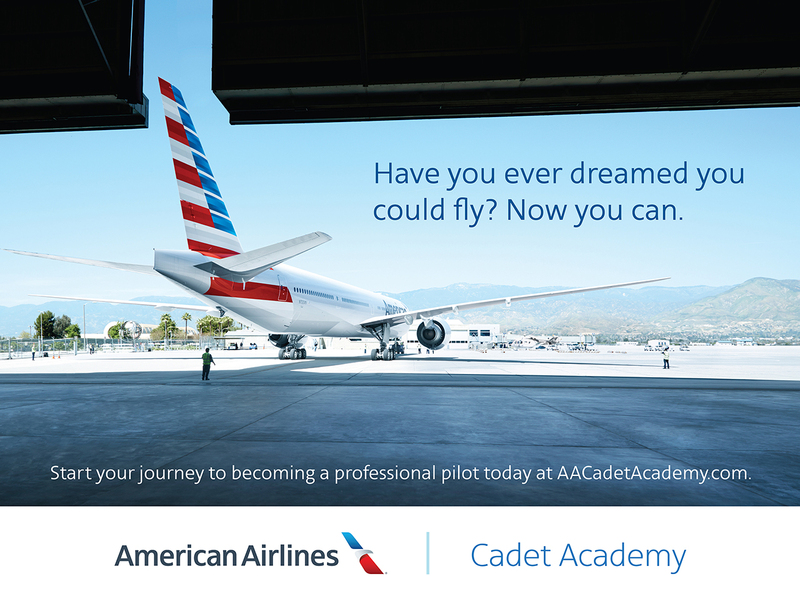 To learn more about the American Airlines Cadet Academy, visit www.aacadetacademy.com. The American Airlines Cadet Academy will provide an opportunity for future pilots to become first officers at one of American’s three wholly owned regional carriers and eventually fly larger aircraft at American. American Airlines and American Eagle offer an average of nearly 6,700 flights per day to nearly 350 destinations in more than 50 countries. American has hubs in Charlotte, Chicago, Dallas/Fort Worth, Los Angeles, Miami, New York, Philadelphia, Phoenix, and Washington, D.C. American is a founding member of the oneworld® alliance, whose members and members-elect serve nearly 1,000 destinations with 14,250 daily flights to 150 countries. Shares of American Airlines Group Inc. trade on Nasdaq under the ticker symbol AAL. In 2015, its stock joined the S&P 500 index. Connect with American on Twitter @AmericanAir and at Facebook.com/AmericanAirlines.